The Adoption Support Fund (ASF) has been established because many families need some kind of therapeutic support following adoption and too many have struggled to get the help they need in the past. The Fund will enable them to access the services they need more easily in future. Who is eligible for the Adoption Support Fund? are adopted and were previously in local authority care in England, Wales, Scotland and Northern Ireland. 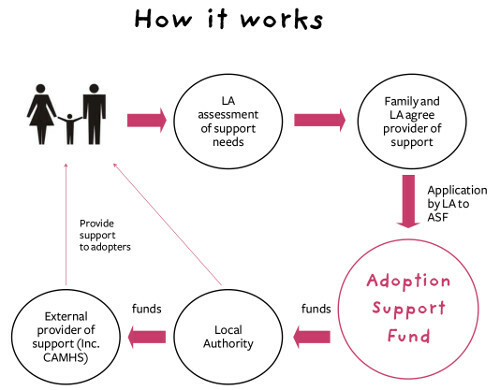 To access the Fund, you will need to have an assessment of your family’s adoption support needs by the local authority. This is a current legal obligation of all local authorities. The local authority that places the child with you is responsible for assessing your adoption support needs for three years after the adoption order. After three years it becomes the responsibility of the local authority where you live (if different). Where the assessment identifies that therapeutic services would be beneficial to your family, the local authority will apply to the Fund on your behalf, who will then release funding to the local authority. The local authority social worker will be expected to talk to you about who can provide the types of service that you need and which provider you would prefer. Local authorities, independent providers (OFSTED registered or the local authority making the application assumes responsibility for quality assurance as an OFSTED registered organisation) and NHS providers e.g. Child & Adolescent Mental Health Services (CAMHS – offering services within the scope of the ASF) can all provide services through the ASF. What support will I receive through the ASF? The Fund will provide money to the local authority to fund a range of therapeutic services. The amount per child per year is capped at £5000 for therapy, as well as a separate amount of up to £2,500 per child if specialist assessments are needed. Therapy and assessment above this amount and up to a limit of £30,000 requires match funding by the local authority. An in-depth assessment of the child and family’s needs with a focus on trauma and attachment, and how this demonstrates the links to the assessment of support needs. Led and undertaken by a qualified clinician(s). For the purposes of the ASF, a qualified clinician would be someone who diagnoses and treats patients; is suitably qualified and is licensed to practice via a regulator such as the Health and Care Professional Council e.g. a trained Clinical Psychologist or Attachment Psychotherapist. Result in a therapeutic support plan for the child(ren) / family. Standalone assessments for single conditions, e.g. ADHD, FASD, autism, sensory integration, unless they are part of a wider specialist assessment which meets the criteria for the Specialist Assessment FAL i.e. are in depth, covering trauma and attachment, led and undertaken by a qualified clinician and resulting in a therapeutic support plan. Standalone specialist assessments, including any baselining specialist assessments, are also out of scope of the Therapy Fair Access Limit. A general social work assessment of adoption/SGO support needs remains the responsibility of the local authority/regional adoption agency. What will the Adoption Support Fund not pay for? Speech and language therapy, physical therapy, occupational therapy, and other universal health services. Where an assessment identifies that you may need other support, such as financial help, or access to peer support groups, the local authority will be responsible for providing this, at their discretion, as is the situation now. The Pupil Premium is available for children adopted from care as well, to help with your child’s needs at school. Good authorities will work together across social care, health and education to provide a holistic package of support. There is further work going on in government to improve mental health support via a Department of Health taskforce and to encourage joined-up assessments of your family’s needs. If you have any further questions about the ASF take a look through our Adoption Support Fund: Q&A for Parents, Adoption Support Fund: Q&A for Service Providers and Adoption Support Fund: Q&A for Local Authorities. If you have any further questions about the Fund, please give our information line a call on 0300 222 0022 and our advisers will be glad to help you.